Aravinda Kumar R.C. III B.E ECE has received Soliton-CPL AWARD and won the second prize with a cash award of Rs.10,000. 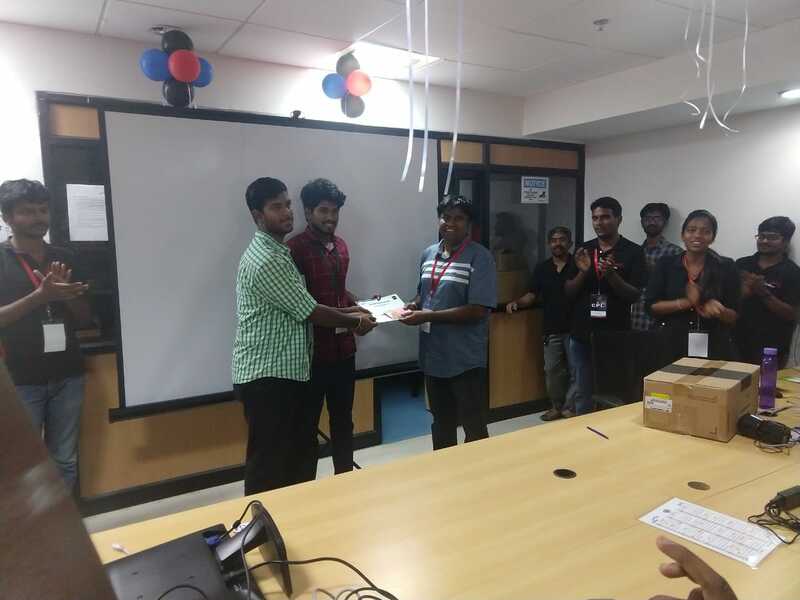 Soliton Technologies, Coimbatore conducted a competition called Coder Premier League. It’s 24 hours bot creating contest in which 75 teams participated all over Tamil Nadu and Andhra Pradesh. The objective is to develop the best bot incorporating the best strategy that can win a game similar to Tic-Tac-Toe competing with other bots developed by fellow participants. Two students from ECE Department - Aravinda Kumar R.C. and Kailash G. both from IIIrd ECE - participated as separate teams. The student Aravinda Kumar R.C. created a bot that can not only make optimal moves but also predicts the opponent’s moves and counteract them. His bot competed against 64 other bots and reached the finals without losing a single match. His bot competed and won against bots from professional, past and current employees of Soliton. He won the second prize with a cash award of 10,000.